Synopsis: Bullock plays Dr. Ryan Stone, a brilliant medical engineer on her first shuttle mission, with veteran astronaut Matt Kowalsky (Clooney) in command of his last flight before retiring. But on a seemingly routine spacewalk, disaster strikes. The shuttle is destroyed, leaving Stone and Kowalsky completely alone—tethered to nothing but each other and spiraling out into the blackness. The deafening silence tells them they have lost any link to Earth…and any chance for rescue. As fear turns to panic, every gulp of air eats away at what little oxygen is left. But the only way home may be to go further out into the terrifying expanse of space. Verdict: Definitely the most realistic and visually breathtaking space experience ever from a movie, with excellent balance of 3-D depth. This is the closest thing you’ll get if you wish to be in Major Tom‘s shoes. 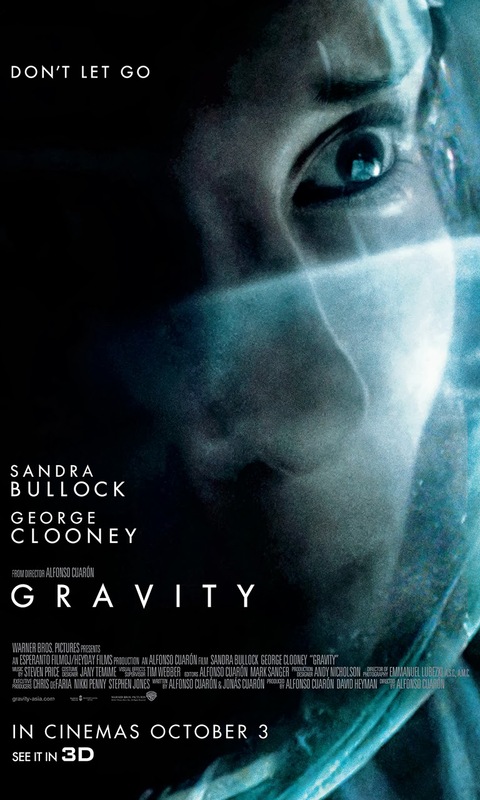 Despite Sandra Bullock’s unconvincing performance (to me only, please don’t boo) and the rather cheesy script with predictable ending (which is, to be fair, inevitable), the film delivers a beautiful and yet gripping space disaster survival entertainment, with the score by Steven Price deepening the emotional flavour to the silence of space. The film also might be highlighting some worrying dangers of space to audiences. Gravity is, without question, an Oscar-worthy film, particularly for its special effects and cinematography. I just can’t wait to see what’s next from the director, Alfonso Cuaron. To watch in 3D? Yes, but only at IMAX theaters otherwise you may not get the full awesome experience that I did. If there’s no IMAX around your place, you might as well just watch it in 2D. Malaysian censorship: Nothing was cut at the press screening. There’s only a second of that one scene that I think the board of censorship might chop off if it’s deemed too graphic for rated U audiences. Plot hole or a message to NASA? I’m not confident on that these are plot holes ’cause I certainly don’t know anything about space, NASA or astronauts. The whole chain reaction of incidents was triggered by a satellite debris that crashes into the main characters’ space shuttle. They’re given a heads up from ground control (or “Houston”) but only a minute or so before they get hit. Now, does that mean that oh-so-popular American government space program are not able to foresee such disaster might happen before it actually happens? Debris is a known issue and yet the ISS (International Space Station) can still be easily destroyed into pieces by it in the movie. Shouldn’t NASA have a solution for this and if they don’t, why the heck do they send these people up there for so many days? But as I said, I’m clueless in this subject. I don’t even know if debris can travel around the world in just 90 minutes as depicted in the film. This is just for the sake of discussion. Maybe it’s really not possible and things in space can be extremely unpredictable. Or perhaps the Cuarons intends to educate the world about this and raise serious concerns for NASA to feel the pressured to quicken improvements. Favourite scene: The first 17 minutes of the film seems like it was filmed in a single continuous shot, from the characters fooling around while working until the debris hit them. Unlike typical scenes in movies, the camera spins, goes around every direction (like floating) and changes its focus without breaking the sequences or cutting to a different angles directly. It’s quite impossible to do so now that I think about it. It’s gotta be some very skilled editing work. Not to mention again about the mad special effects. Absolutely brilliant! It did indeed got me a bit dizzy though, but that’s how it is in space, you’ll be floating and spinning around GRAVITY-less. I just didn't buy it. It feels overly scripted. Agree Tony, no regret to pay for IMAX 3D. This should win something from Oscar. Did you check the movie on kids-in-mind.com? It says there are "At least 1 F-word, 1 not fully enunciated F-word…" in the profanity section. Didn't hear those when I watched it.